Agios Nikolaos, about 55 kilometers east of Heraklion, and about that same distance west of Crete's eastern end, is topographically unique to the rest of Crete because its built on three hills surrounding a lagoon which, since 1867, has been connected to the harbor by way of a narrow channel. Until then the stagnant waters of the lake would tend to smell, giving it the name "Vromolimni" (Stinky Lake). The town itself surrounds the lake. 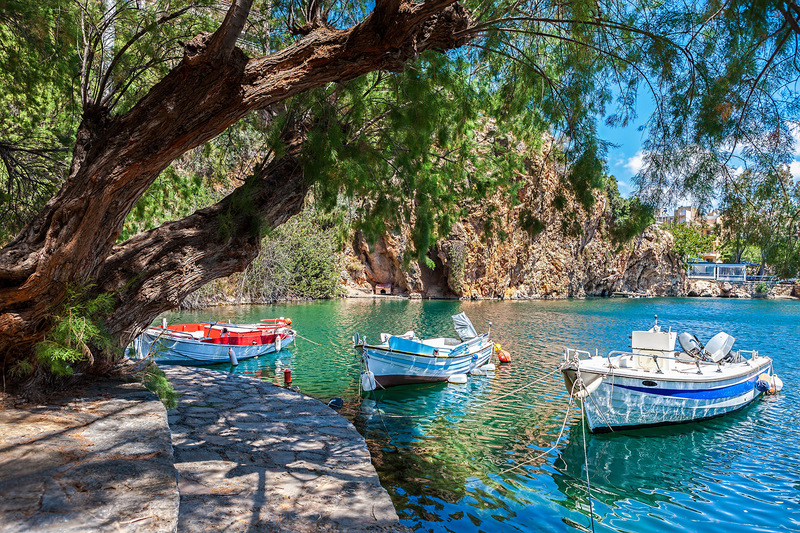 Agios Nikolaos is the patron saint of sailors, and of Greece itself. It's a familiar place name throughout Greece. The Gulf of Mirabello, on which the town is sited, was named, they say, during the Venetian Occupation (1204-1669) by an Italian ruler who, looking down from the surrounding mountains declared "Mira bello!-" Beautiful sight! And he was right. 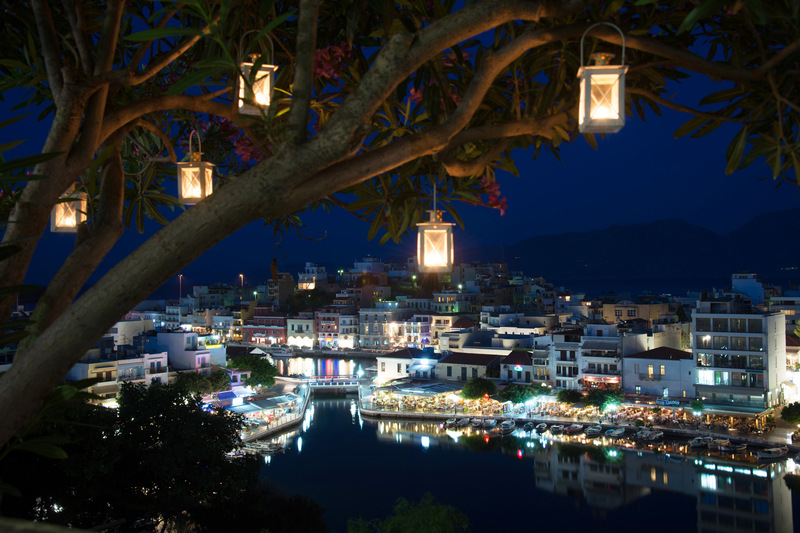 Agios Nikolaos is an exceptionally beautiful, self-contained little town, and one of the most popular destinations in Crete. All in all, this picturesque place is ideal for photographers and painters. The legend that the little inland lagoon (diameter 140 meters) around which Agios Nikolaos is built is bottomless was debunked in 1976 when legendary oceanographer Jacques Cousteau paid a visit during a trip to Greece to research the lost kingdom of Atlantis. (Agios Nikolaos is built upon the ruins of the ancient town of Lato.). He had a diver sound the lagoon and found that it was only about 70 meters deep-pretty deep for a small inland lagoon, but certainly not bottomless. This did not endear Cousteau to the locals. The lake's walls are almost completely vertical, leading some to suppose that it was an extinct volcano. It is now thought to be the mouth of an underground river. Local myth holds that the goddess Athena used to bathe there. During Easter celebrations, an effigy of Judas is burned on the lake. Of greater interest to the residents of Agios Nikolaos was the discovery, in the Gulf of Mirabella near the islet of Pseira, numerous Minoan-era ceramic containers probably used for olive oil and wine, and thought to have been part of a shipwreck which occurred when Santorini blew up and caused a massive tsunami which wiped out Lato, and the Minoans, about 1600 BC. At any rate the lagoon- called Limni Voulismeni (Sunken Lake)- is lined with excellent restaurants, taverns, and cafes, its lakefront promenade packed with strolling Greeks and tourists in the cool of a summer's evening. The nearby seafront promenade is equally scenic in the evenings. It's all very pleasant. Agios Nikolaos is a fun place to walk around in; it's compact, its streets narrow and full of small surprises, but its hills make walking good exercise as well. Boats for hire give you a nice view of the town and its surroundings. The nearby islet of Agia Pantes is a preserve for the kri-kri, the Cretan wild goat or ibex. 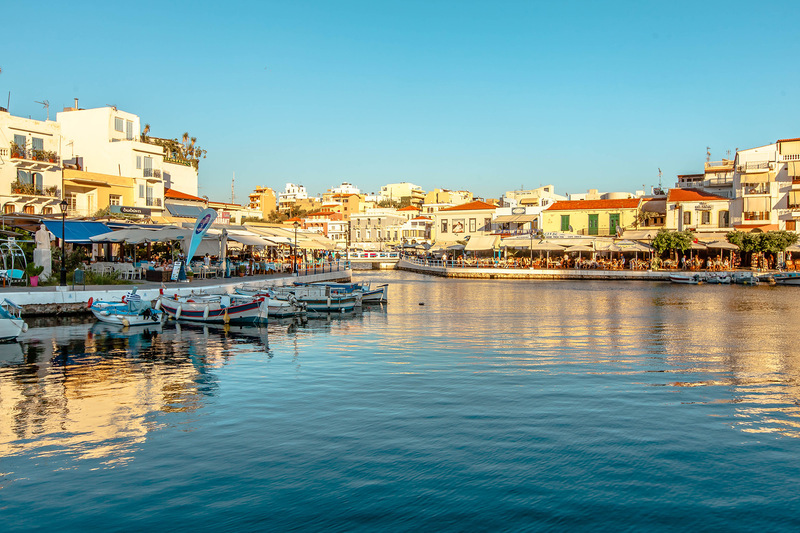 Agios Nikolaos also boasts a lively night life, with clubs and discos going full blast late at night, particularly on Koundourous Street along the harbor, and on 25th of March Street. The town hosts several festivals during the summer season, best-known of which is the Lato Cultural Festival, held in July and August, featuring concerts by local and international musicians, folk dancing, theatre, art exhibitions, and mantinadhes (rhyming couplets) contests. Not far from Agios Nikolaos is the archeological site of Priniatikos Pyrgos ("Pyrgos" means "tower"), a late- Stone Age (3,000 BC) to Minoan Bronze Age settlement which was rebuilt and continued to be inhabited after the Minoan Eruption on Santorini, up through the Classical Greek and Roman periods. This coastal settlement has been excavated since 2007. Agios Nikolaos has an excellent archeological museum, the second-best on Crete, where some of the excavated artifacts from Priniatikos Pyrgos are exhibited. Other newer finds from eastern Crete are also exhibited, along with some artifacts from the Heraklion Archeological Museum. The museum houses finds from several Minoan-era graves, including tools, incense burners, jugs, chalices, amphora and bronze daggers. Figurines, small statues, even a skull of an apparent athlete still adorned with a gold wreath around his head are featured as well. Entrance fee is 2 Euros. Not far from town is the Diktaen Cave, probably the best-known cave in Greece, because it is considered the birthplace of the god Zeus. It has been a place of local cult worship for thousands of years. The cave has 5 main chambers, and at its deepest point there is a stalactite and stalagmite-encircled lake. The Mantle of Zeus is a massive, chandelier-like stalactite-stalagmite formation hanging over the lake. At the back of the lake is a chamber where Zeus is said to have been born. Agios Nikolaos has several good beaches. Havania Beach has nice sand, and is on the northern edge of town. It has restaurants, and is an organized beach. Ammoudi Beach is another town beach, in a cove in the town. It's small, and can be crowded. Beyond the beach is the church of Agios Nikolaos, which has some nice wall frescoes. Kitroplateia Beach is close to the town center and offers restaurants, and is also organized with umbrellas and sun beds. Ammos Beach, just beyond Kitroplateia (after the marina) is a nice sandy beach with umbrellas, and close to restaurants and hotels. A bit further south is the Municipal Beach run by EOT, Greece's national tourism organization. The EOT beaches, which charge admission, are generally very well run, and this one's no exception, offering a nice lawn and shade trees in addition to a pebbly beach. Almyros Beach is Agios Nikolaos's biggest and best, located 2.5 km from the town center. 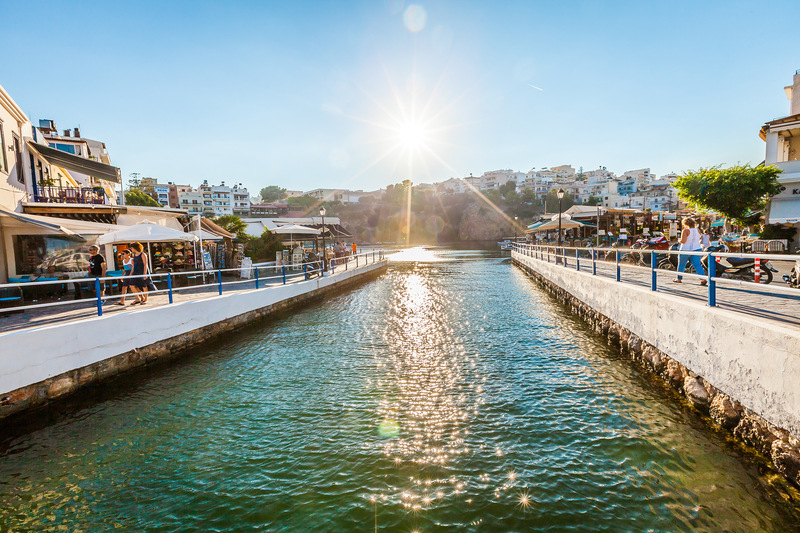 It's located on a river delta where the housewives of Agios Nikolaos used to come and wash their clothes. The delta has reeds, and eucalyptus trees. It's a nice beach with shallow water for small kids, with hotels nearby. Agios Nikolaos is a great place to spend time, and to explore other areas of Crete from. It can't be exhausted in just a two-week stay, and its beauty practically begs you to come again and agian.